Somehow I figured out the way to newly install windows XP home edition along with ubuntu. Using ubuntu live CD deleted the Win partition and newly installed ubuntu keeping the home partion intact (since intrepid was giving me some trouble related to network - static/dynamic). 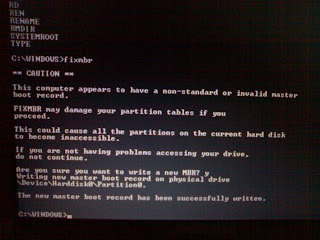 Now I was able to get over the problem and was able to create partitions using win partitioner, but at the time of instation it would again enter into the "Setup is inspecting your computer's hardware configuration" and would start again॥ soo i did the the ubuntu installation again which got the windows entry in the bootloader and selected the wind option now enter the win boot cd and continue with the installation.. Remember to remove the win boot cd at the time of restarting.. I freshly installed everything. In that I made sure that i use the ubuntu partitioner because windows Xp home provides only one primary partition while ubuntu provides 4.